Ooooh, I love this book. I could quite happily eat my way through each and every one of Peggy Fallon’s gorgeous desserts! Dan Kartong, 1978 US Olympic Marathon runner said “without ice cream, there would be darkness and chaos”. That might be a bit of an extreme view but I understand the sentiment. Each page is well designed with some background information, method and a side panel of ingredients. The recipes are easy to understand and consist of recipes not only for making numerous ice creams from scratch, but also for constructing gorgeous desserts using the ready-made article. For instance you could make the Warm Chocolate-Espresso Tart with Espresso Gelato using commercial coffee ice cream. Tiramisu Parfait also uses the same coffee ice cream. Buy a big box of that! Manhattan Float sounds very sophisticated and has a slug of bourbon and vermouth. Or how about finishing a classy evening with Spiked Espresso. It’s a kind of Irish Coffee with cooling and melting ice cream instead of the usual collar of cream. I’ll use this idea in future as I can never get the cream to float in the original version. Green Apple Sorbet is light and fresh-tasting. I use calvados in the mix and serve it in a martini glass with some cinnamon biscuits. It would make a change from the heavier traditional apple tart at the end of a French meal. Frozen Chocolate Dessert Lollies couldn’t be easier. It’s chocolate custard poured into lolly moulds and frozen. The kids would love to have a go at this one. Think I would as well! 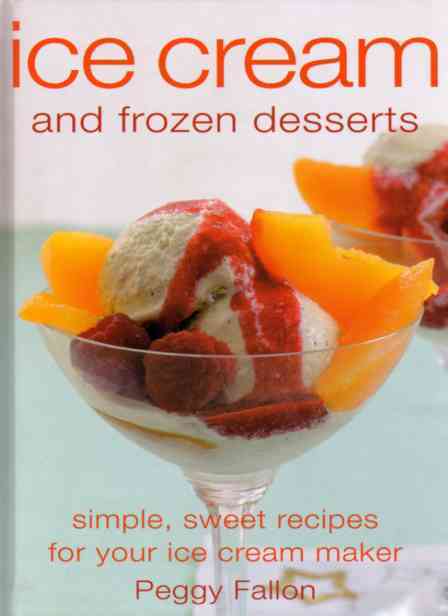 For those of you with an ice cream maker you can also have a go at making Frozen Yoghurt. If you haven’t already tried this I can tell you that it’s a light and tangy version of regular ice cream and is often less sweet. Peggy has also included several recipes that use soya milk. Brown Sugar-Pineapple Iced Soya Milk sounds delicious. Ice Cream and Frozen Desserts has dolly-mixture pastel summer colours and is wonderfully photographed. It will encourage you to go out and buy that ice cream-making machine you have been talking about for ages.